There are two sections to Padang Padang beach and this is the larger and less well-known about section. People usually can't see this section of the beach when they're approaching from the bridge but it is definitely the more picturesque one. 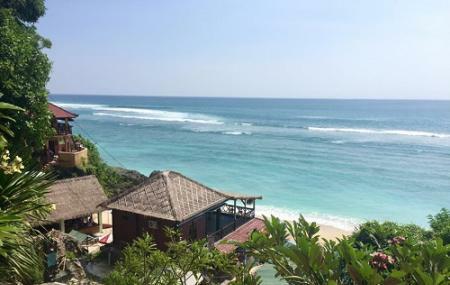 It is located directly below the Thomas Homestay, a cheap guest house, beside which you'll find the access to the beach which also leads down to a restaurant. It is a long stretch of sand and almost always deserted. It is usually windy over here. There are chairs with parasols for shade. But you can also find shady trees to sit under. the nearby restaurant means you don't necessarily have to bring your own food and water. How popular is Thomas Beach? People normally club together Banyumala Waterfall and Jimbaran Bay while planning their visit to Thomas Beach. People also prefer to end their day with Thomas Beach. This is the beach where they filmed in Eat Pray Love. There is an entrance fee to get in to this beach. There are facilities on site for bathroom and showers as well as a little spot to get drinks/snacks. It was pretty quiet but my guide told me it definitely gets busier in the higher season. It was beautiful though and the water was calm and clear. It’s a small beach, but beautiful and a good visit nonetheless. A short climb down a few stairs, one part through the rocks, you will reach one of the cleanest beaches that you can find. Although there's a lot of seaweed that flows in, the beach itself is beautiful. There is a place right behind to take a shower and a washroom too, if you want to take a swim. You can also hire surfboards and go surfing. The water near the shore is very calm and there are no waves at all. You can easily go neck deep without any problem. Don't worry if you didn't pack towels or extra tees, you get them at the beach. Take a swim, relax by the beach and grab a couple of beers or sweet coconut water and just sit. This beach gets crowded as the day goes on. Try hitting it early around 10 - 10:30 in the morning for a relaxing outing. great place. the public facilities well maintained. the stairs a bit steeped. its better when the tide is low, we can explore so much more place here, just remember to go back before the tide is high. Beautiful views and no waves for a perfect soak. If u want to surf, paddle out about 100 meters for some 3 footers. Beer is close by and umbrella rental is recommended!